A novel celebrating America’s vibrant 20th century. When Gabriel Rivages recounts the life of Olympic gold medalist and silver-screen heart-throb Johnny Weissmuller (1904-1984), he brings to life a vibrant patchwork of America’s 20th century, from its athletic exploits to its literary underground, from its cinematic glory to its obscure failures. Burroughs sells pencil sharpeners, Einstein crosses paths with squirrel hunters, we play golf in Cuba, JFK becomes an airport, the world record for the 100m freestyle swim is broken, Tarzan saves Jane, a corrupt accountant runs away with the savings, the Second World War makes waves in Lake Michigan, and a living legend wraps up a storied career as a host in a Las Vegas restaurant. 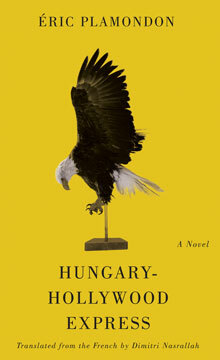 Hungary-Hollywood Express is the first novel in Éric Plamondon’s 1984 trilogy. The second and third volumes, Mayonnaise and Apple S, turn their lens on the poet Richard Brautigan and Apple founder Steve Jobs respectively. Esplanade Books will publish them in 2017 and 2018 translated by novelist Dimitri Nasrallah. Éric Plamondon was born in Québec in 1969 and currently lives in Bordeaux. He is the author of the 1984 trilogy, first published by Le Quartanier and quickly considered shining examples of a new generation of Québécois literary innovation. The trilogy has been published in France by Phébus. Plamondon has also published a novella, Ristigouche. Dimitri Nasrallah is the author of two award-winning novels. 2011’s Niko won the Hugh MacLennan Prize for Fiction, was longlisted for the 2013 International IMPAC Dublin Award and the 2016 edition of CBC’s Canada Reads.2005’s Blackbodying won the McAuslan First Book Award and was a finalist for the Grand Prix du Livre de Montréal. 164 pp 7.5" x 5"